Growing up, my family did not spend much time outside during the winter season. Most of our time was spent in arenas, as my sister was a dedicated hockey player. Otherwise, we spent the days huddled into our home, basically hibernating. So, it was not until a few years ago that I learned the secret to making those long winter months, go by much faster. 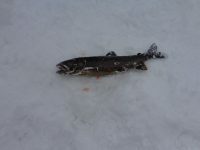 Ice fishing is one of the many activities that one can jump into in order to discover the joys of winter. I had the opportunity to spend the day on beautiful Windy Lake, just north of Greater Sudbury last year to enjoy the peaceful serenity of the great outdoors. 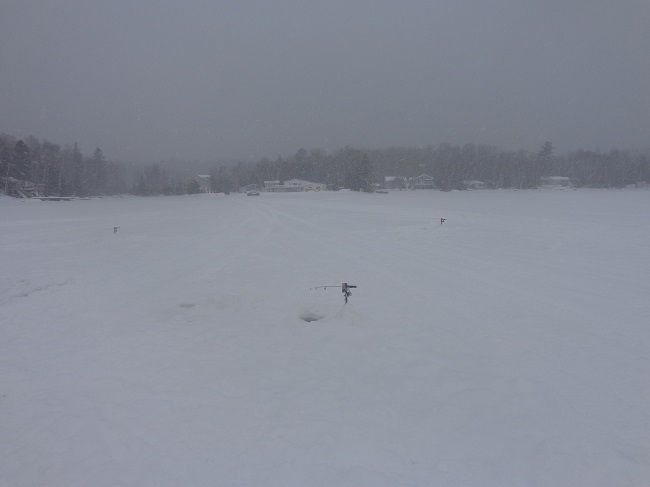 I bundled up with multiple layers of clothing, grabbed my fishing gear and bait, and set out on my trip. The ice was perfect, an approximate 50 cm where our group was situated. Since we were multiple people, we were able to set up quite a few lines, (up to 2 per person) to give us more chances to obtain our catch of the day. 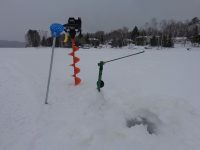 Once we arrived to our fishing spot, we took out the ice auger and began making our holes in the ice. We were fortunate enough to have a gas ice auger, which saved us a lot of time and energy. It’s hard work manually cutting a hole through 50 cm of ice, but completely doable if that is the only equipment you have on hand. 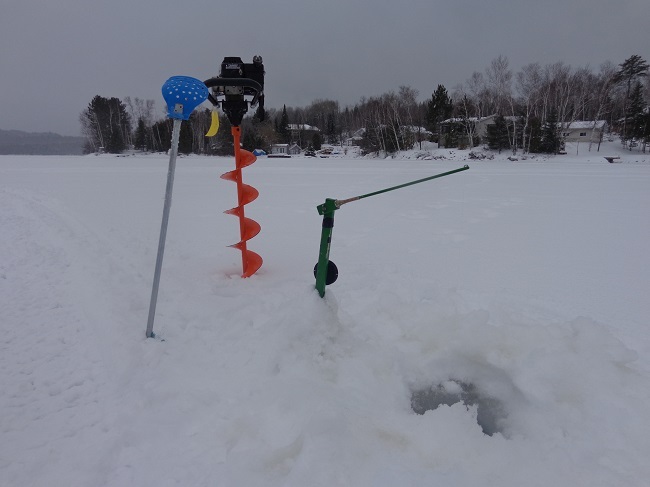 It is then important to clean the holes of any floating ice/snow left in the hole so you will not have a hard time reeling up your fish once they start biting. We used the blue scoop to clean the holes. There are multiple different contraptions one can use to fish. We have a few homemade rods, along with some we have purchased at the store. 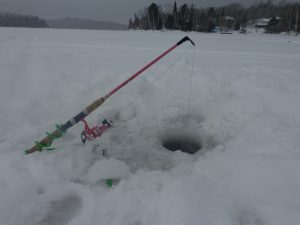 Ice fishing rods are usually a lot flimsier, which makes it easier to notice when a fish is biting. You need to be ready to run at the first sign of any movement on the rod, or you might risk losing your fish. Contrary to what many may believe, ice fishing can be incredibly exciting and fantastic exercise on a busy day! When my summer fishing rod broke this summer, I was devastated. My partner, being able to create anything out of anything, turned my broken rod into a wonderful ice fishing rod. It worked perfectly, and I even caught a Ling on it! (For some reason, Lings have a bad reputation, mostly because they look a little odd, but they are absolutely delicious when cooked properly). We fished with Shiners, a type of minnow that make it easy for fish to spot under water. I wouldn’t suggest this kind if you embark on anything longer than a day trip, though, since they usually die within a day or two. 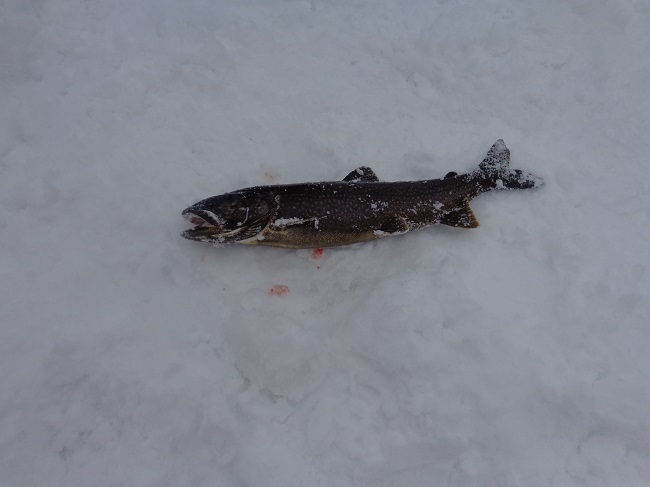 Along with the Lings, we also caught Lake Trout. Those are the most common catches on the lakes around here in the winter time. It was an incredibly cold day, but the excitement provided from reeling in a big one is incomparable and well worth a few frozen limbs. Luckily, we had an ice hut with a nice wood fire to warm us up from the bitter cold, and packed with snacks to fill our bellies throughout the day. Good food, great company and amazing memories; despite the cold, I could not ask for a better day.